The house foundation is about 3’ above grade. 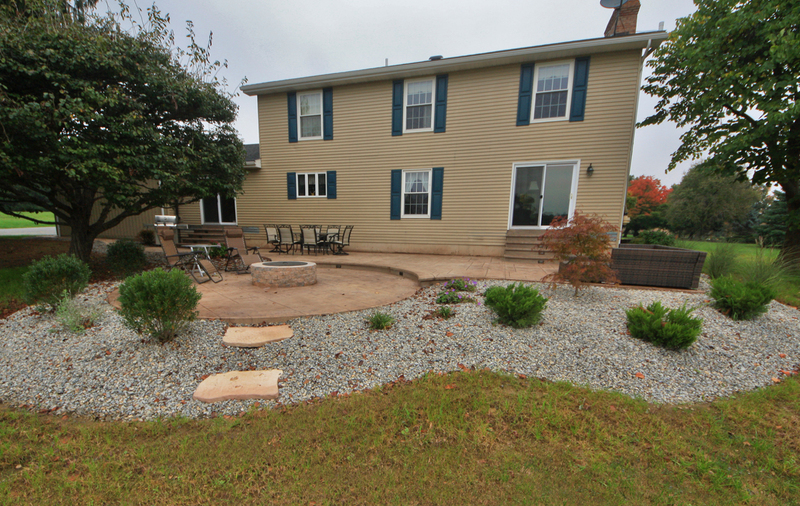 There is an paver patio with two separate decks from the two main access doors into the house. A garage is attached to the house on the northwestern side. 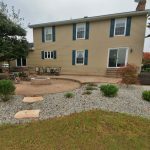 There is no proper access from the driveway to the main backyard area and there are large evergreen trees in between that area. There is room to walk in between the garage and the tree however, the trees have large roots above grade, creating a trip hazard. 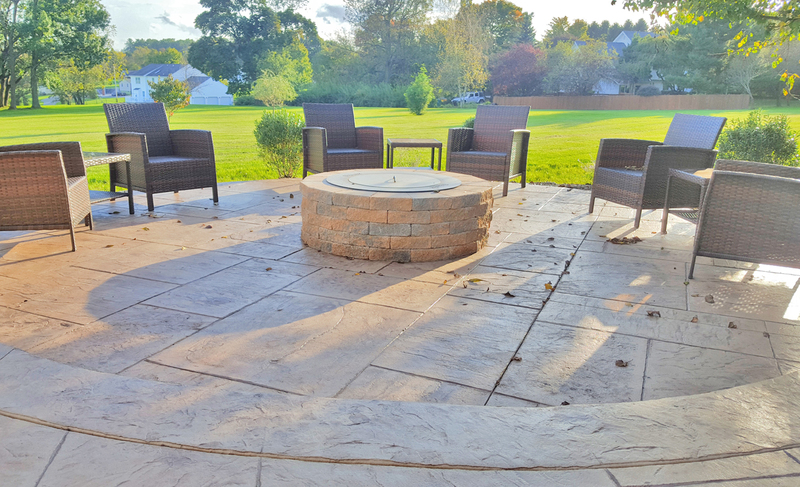 There is also a small pitch to the first half of the backyard. There is all lawn after the first 30 or so feet beyond the house. 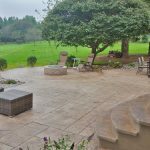 Our client wanted everything removed and to start fresh by adding a new patio with plenty of room for large gatherings. 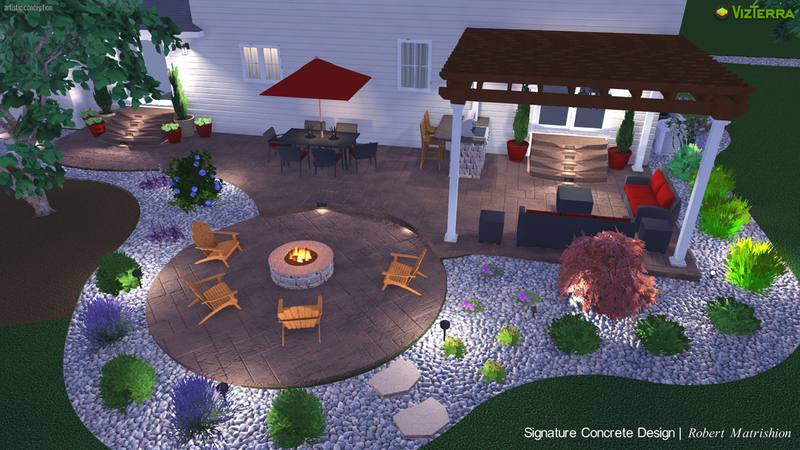 They wanted to create and area for a fire pit, and area for a shade covering, and an area to grill and dine. 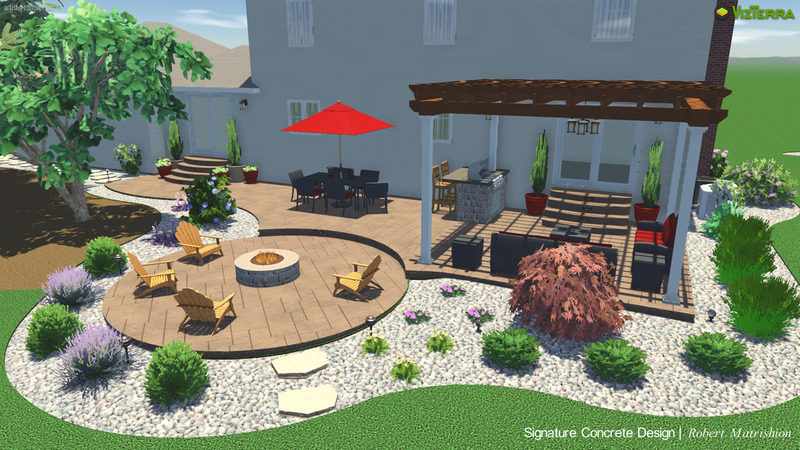 They wanted to add landscaping and connect the patio to the driveway with a walkway. 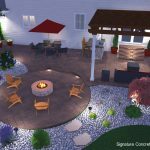 At first, they were looking to add pavers for the main patio material. 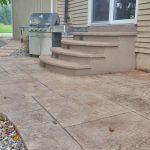 We introduced them to stamped concrete, which we specialize in, and discussed pricing with them as opposed to pavers. 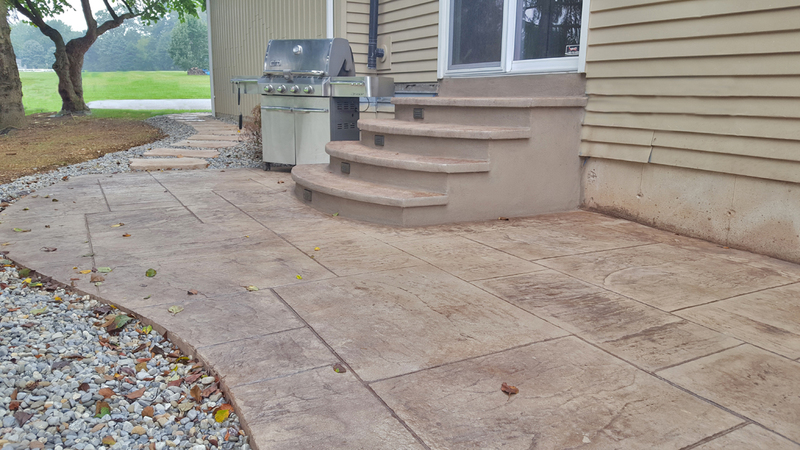 After seeing some stamped concrete projects that we installed, they loved and decided to use it. 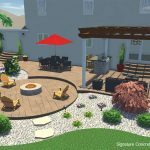 This would free up more of their budget that they can use on landscaping and possible doing a pergola and an outdoor kitchen. 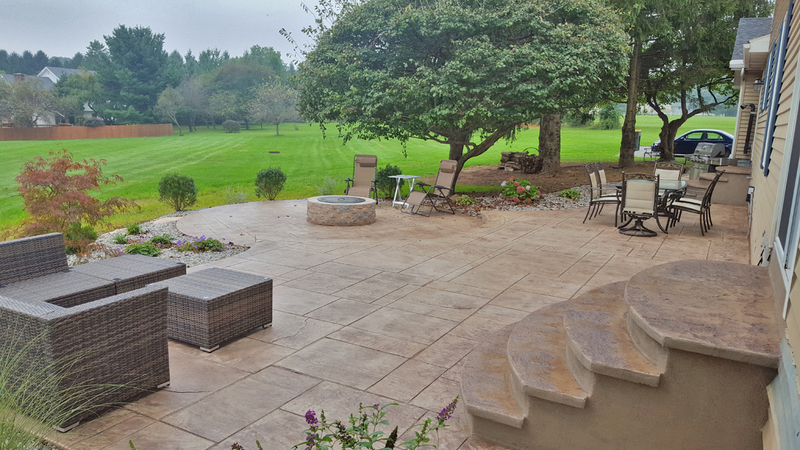 Our two-tier, 1000 sf, stamped concrete patio was designed to flow around the existing trees and match the slightly sloped terrain. 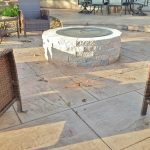 Our patio design was curved to create three spaces on the top tier and use the bottom tier as a fire pit area. 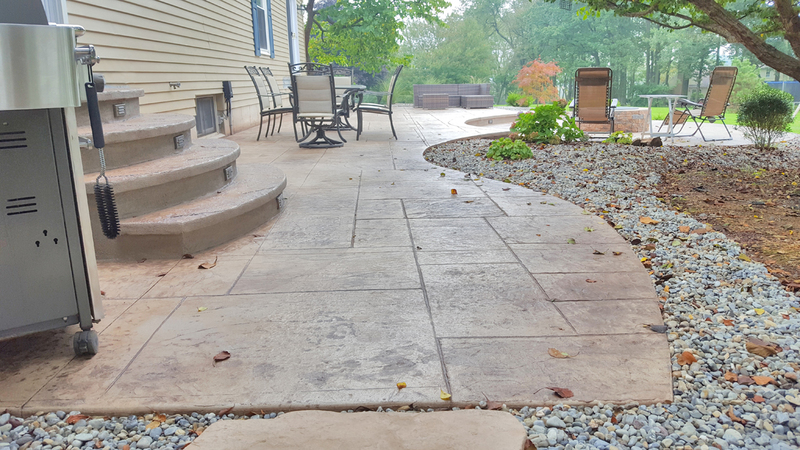 To match the patio color, we constructed two sets of steps out of the main entrances of the back of the house. 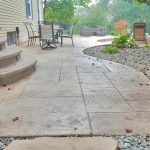 For the stamped concrete we used a large slate stamp where the top tier was angled perpendicular to the house and the bottom tier was angled at a 45 degree angle. 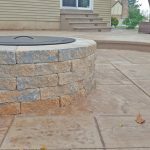 To connect the patio with the driveway, we filled in area that had exposed roots using a decorative stone and filled in the new stone bed with Techo Bloc Maya stepping stones. 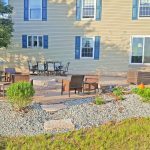 We surrounded the entire patio and up the eastern side of the house with perennials and shrubs in a decorative stone bed. The perennials include daylilies, coral bells, geraniums, russian sage, and some ornamental grasses. 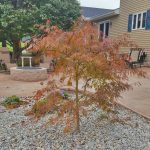 For the full sun area we used inkberry and juniper. 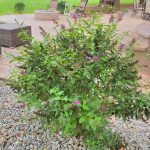 For the slightly shaded areas we used hydrangeas and butterfly bush. 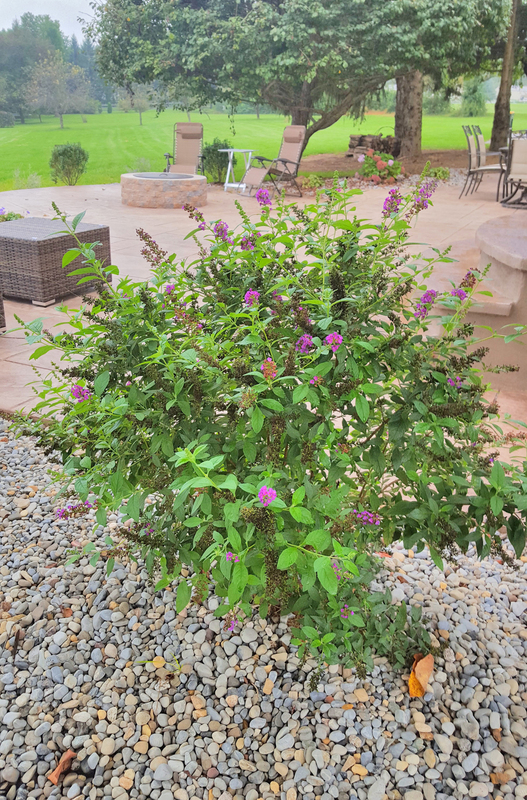 For the deep shaded area we used andromeda, azalea, and rhododendron. 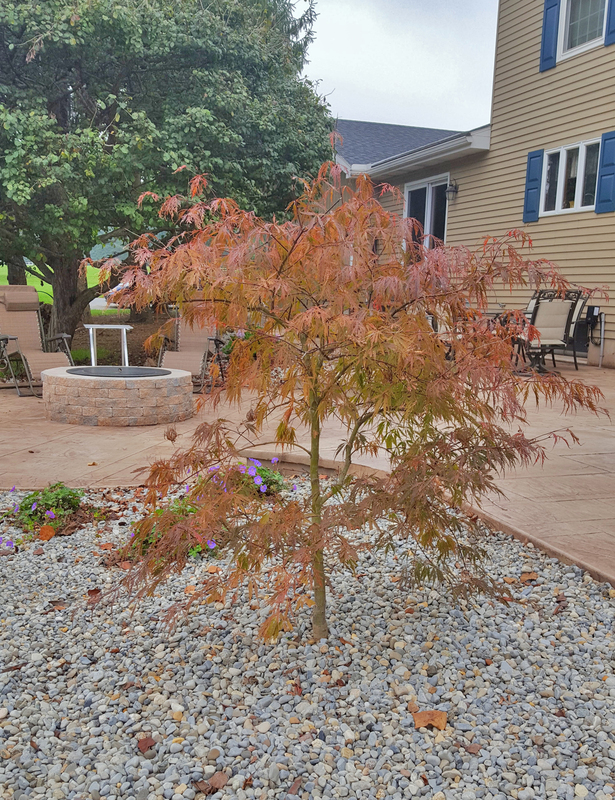 We also added a beautiful Japanese maple for the focal point area right in between the lower tier and upper tier. 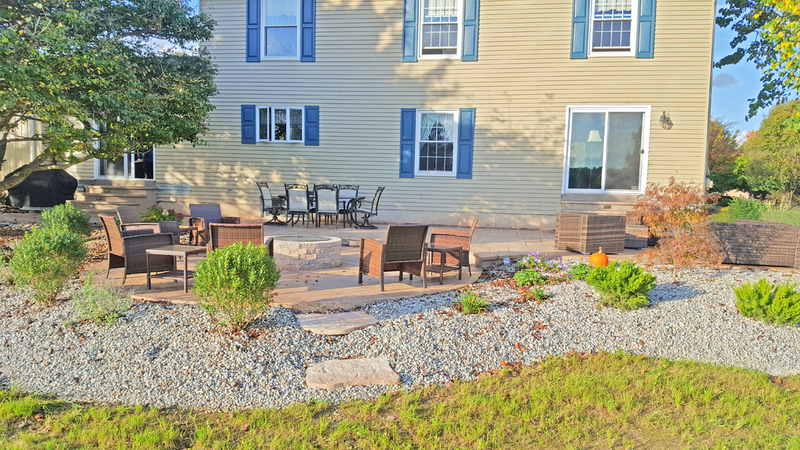 Also incorporated in the landscape bed we created and access area to the backyard. 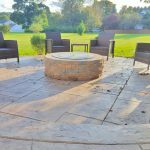 Since the beds were sloped down to meet the existing terrain from the patio we used Techo Bloc Maya stepping stones, which would match the other side of the patio, creating a balance of materials. 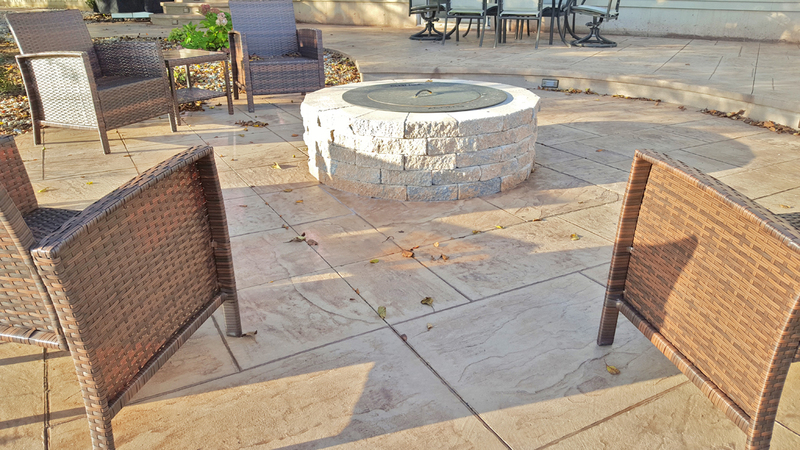 A Techo Bloc Valencia fire pit was installed on the lower tier patio. 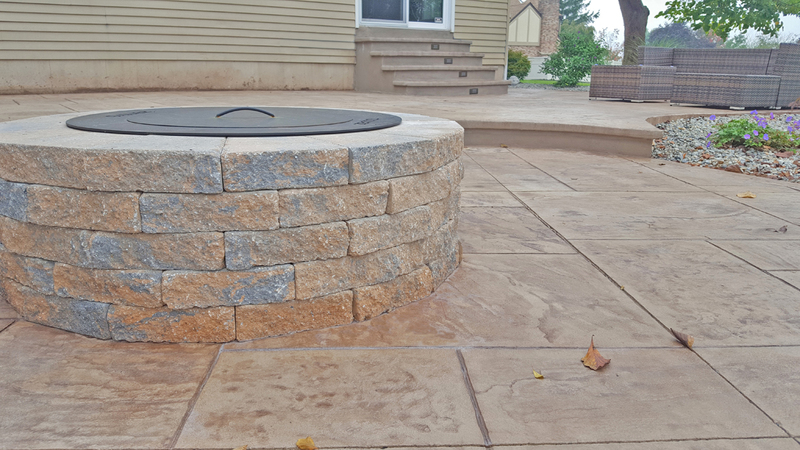 Instead of using the standard fire ring, we used a Zentro smokeless insert.